The Thirty-Eighth Regular Session of the Human Rights Council (HRC or Council) was held at the Palais des Nations in Geneva, Switzerland from the 18th of June to the 6th of July 2018. The Council addressed numerous grave human rights situations in various regions of the globe and on a number of issues and on specific situations. 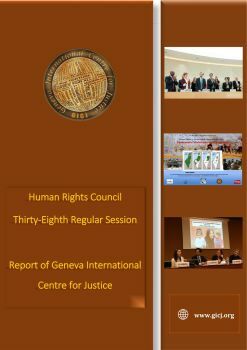 These were delivered by 24 independent human rights experts, working groups and investigative bodies and 105 reports addressing 36 themes and 44 country situations were delivered; additionally, four panel discussions were held and 11 oral updates were heard; the Universal Periodic Review outcomes of 14 states were adopted and statements by six high-level dignitaries were heard. In all, representatives from 147 states, 260 non-governmental organizations and 16 national human rights institutions (NHRIs) participated in this Council’s Session.